All the bungalows and lodges have a terrace overlooking the sea, and are equipped with fan, fridge and safe. Eden Lodge (free transfers between the 2 hotels, 3 nights minimum in each hotel. Does not apply with promotion). 25% deposit payable upon booking confirmation. All stays must be paid in full, 7 days prior to arrival. The conditions of cancellation apply upon confirmation of booking. Payments for stays can be made by Paypal, credit card or bank transfer. 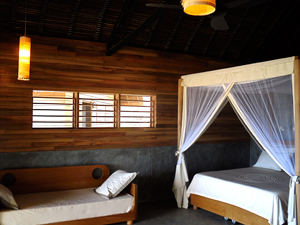 Extras (drinks, massages, ...) are payable locally by credit card, cash, or Malagasy check. Deposits and payments can be made in France.